Are you still using MySpace? I’m pretty sure there are still some if not many of you who are still maintaining your MySpace account. Or perhaps you’re still active in MySpace? If you are, you’re probably waiting for MySpace to launch its new My Music portal. Well, it just did, went out live in beta. My Music 2.0 aims to become your hub where you can build and manage social playlists from My Space’s comprehensive online music catalog. And what does the new My Music 2.0 offers? Quite plenty actually, which include a new sleeker UI and several nifty features. In addition, My Music 2.0 now also lets you broadcast playlist on your MySpace profile and share it directly with your friends. There is also a new “song activities” module which displays the latest song related to your activities. 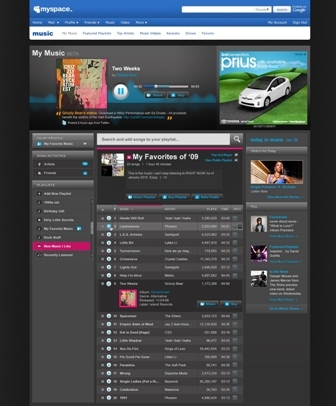 This makes it easier other MySpace members to discover most recent music that their friends or other members are sharing. You can check out MySpace My Music 2.0 from this link.